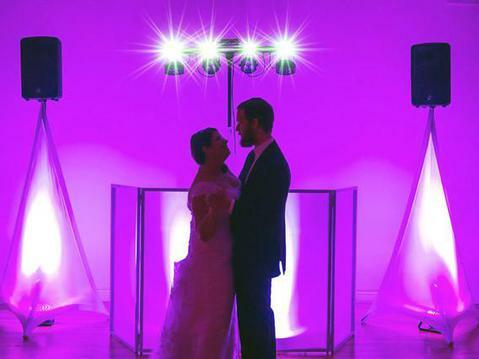 At Reil Entertainment, we treat your wedding day as if it were our own. DJ Greg has been entertaining Wedding Guests for over 11 years. He makes you feel comfortable knowing that everything regarding the entertainment will be done with great care and professionalism. We make your day a day to remember for a lifetime. Weddings are what we do. With DJ Greg keeping the flow you can't go wrong. From your first meeting right up to the big day, DJ Greg is with you the whole way. He makes sure that everything flows the way it should. Offering full M.C. Services as well as uplighting to set the mood. We have a music database that spans the decades from the 1920's to today's hits. We keep up to date on all the new music. Don't have that song? No worries we make sure that we have all the songs that you need. At no extra cost. We do not charge for overtime and Consultation is always free. Call now to check availability at 413 326 1050 or click on the link above. The Pioneer Valley's Leading Source for DJ Entertainment for Over 14 Years.